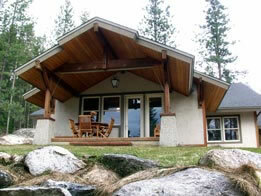 This North Idaho mountain home was featured in the Dec. 2005/Jan. 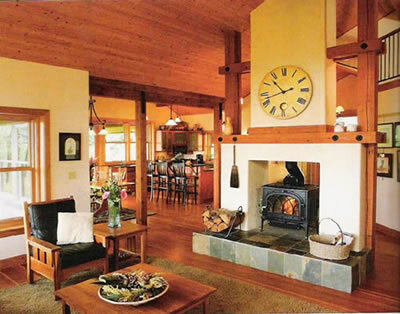 2006 issue of "Fine Homebuilding" magazine, and the Sept./Oct. 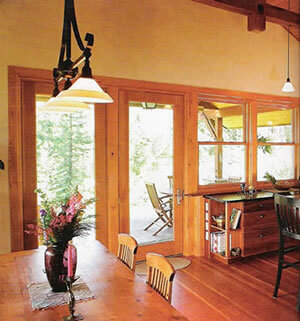 2004 issue of "Natural Home" magazine. And it was subsequently featured in a special edition of "Best Of Fine Homebuilding" titled Small Homes That Live Large, where it was selected as one of the best 15 smaller houses (under 2,500 sq. 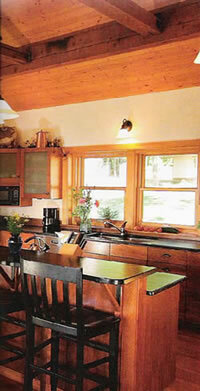 ft.) featured in Fine Homebuilding Magazine over the last 25 years! 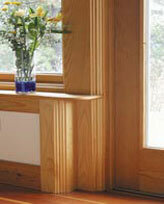 It was originally designed to focus on the southern and western views, and the warmth of a southern exposure. 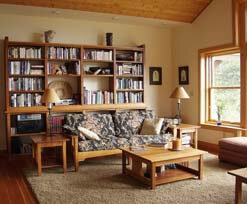 The interior spaces are arranged to be both open and private, and adaptable to a changing family. 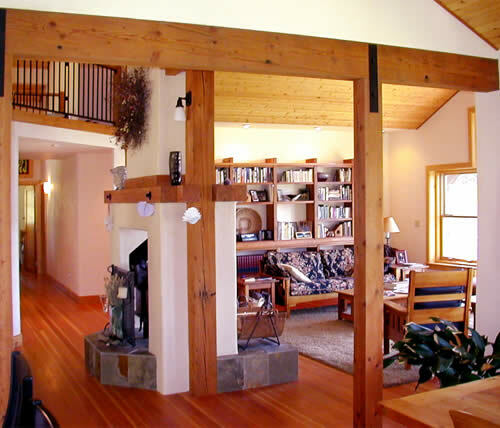 Its home office, open loft, multi–use bathing facilities, and large porches create a home that is spatially efficient, flexible and healthy. The construction is extremely durable, and sustainable, enclosing a home that wears in, not out. 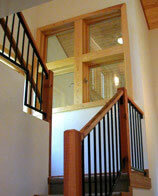 Coming off the covered entry porch, the foyer opens up to the living area of the house. 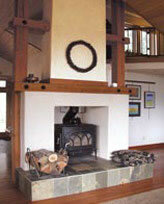 The living room ceiling vaults to 13' down the center, and it features a centrally located free–standing fireplace. Sliding glazed doors at the end of the room lead to a patio at the rear of the house. The living room, dining room and kitchen are all open to each other. The ceiling in the kitchen/dining area vaults to 14'6" down the center, and a door between the two spaces leads to a side porch. 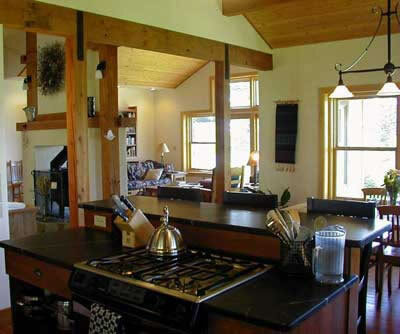 The kitchen features a large center island with a 4–burner stove, so that the person doing the cooking can see all the activity in the house. A hallway on the other side of the house leads to bedroom 2, stairs to the upper level, the master suite, and a home office. Bedroom 2 has a lovely window seat, and the toilet area of the full bath functions as a guest powder room as well. The master bathroom also has a private toilet area, and both rooms share a shower area. The ceiling in the master bedroom rises to 12' down the middle, and in the office the ceiling angles up to 13'. On the upper level, bedroom 3 was left unfinished by the original homeowners during construction. The angled loft area looks down to the living spaces. Its ceiling vaults to 11'. 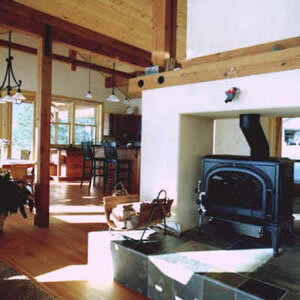 The original construction materials included Rastra recycled foam insulating concrete form walls (ICF's), structurally insulated roof panels (SIPS), reused wood timbers, and cement stucco exterior. 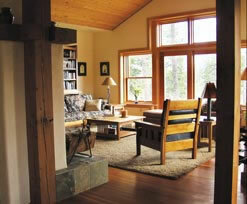 Reused timbers that protect the house from the demanding northern climate support the gable porches and large overhangs. The interior was finished with tinted gypsum plaster, wood ceilings and trim, and natural, durable, healthy finishes. 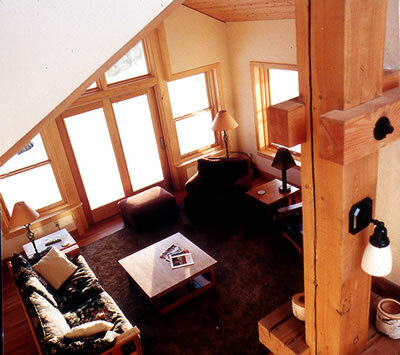 Large double–hung windows in the 12" thick walls fill the open gable interiors with light, while the interior windows, open staircase and open loft provide natural summer ventilation. Although this home was designed with ICF and SIPs construction, it can be changed to standard stud construction by your builder or design professional. Be sure to confirm this with your builder prior to purchasing the plans. 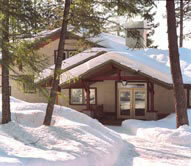 If you would like to read about Mountain Gable's Healthy and Green Features, please click here. 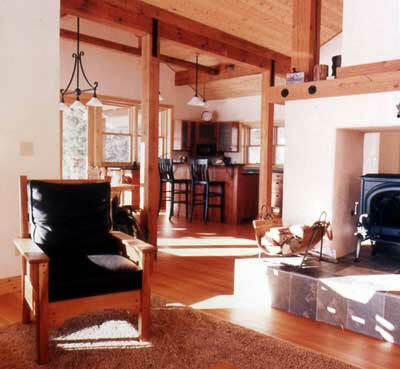 The interior of this handsome mountain home features wood detailing throughout. As you face this Craftsman–style house, the gable over the entry is repeated twice on the left as the rooflines step back. All of the rooms on the main level have excellent views, especially to the rear, and nearly all have ceilings that vault to a dramatic 13'. 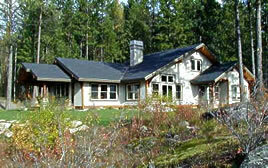 This house has been featured in three magazines, including a special edition of Fine Homebuilding.